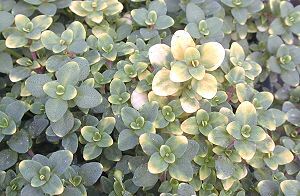 Green throughout most of summer and fall, Doone Valley Thyme enters its variegated stage in the cool of Spring. 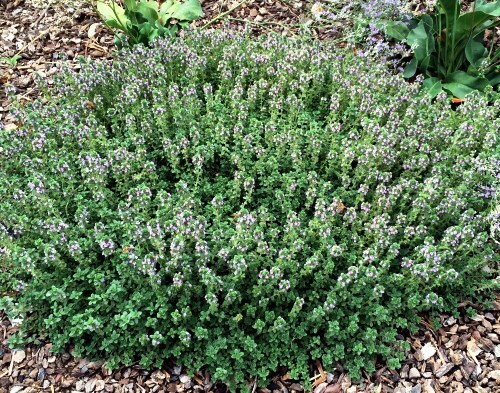 Heavily scented of lemon, Doone Valley Thyme makes a nice little mat or mound for filling in and around taller plants like Grape Sage or Lemon Verbena. Each plant spreads to about 18 inches and produces 3 or 4 inch long flower heads full of pink flowers. If a flatter ground cover is desired, these flowers should be sheared off after bloom. If they are left, the thyme will crawl over the spent flowers, adding height to the mound. We list Doone Valley Thyme as hardy to Zone 6, but there have been some reported successes in Zone 5. It is helpful to mulch around ground cover thymes to fend off encroaching weeds until the plants can fully shade the ground from any light that might germinate weed seeds. When mulching, do not cover the plants; rather surround them with mulch and filter the mulch down into the thyme with your fingers. Doone Valley Thyme is not a cooking thyme. The Lemon scent does not hold up in cooking as regular Lemon Thyme does. However, both the leaves and the blossoms can be used as brilliantly colored, fragrant garnish. Or, you can leave the flowers for the bees. 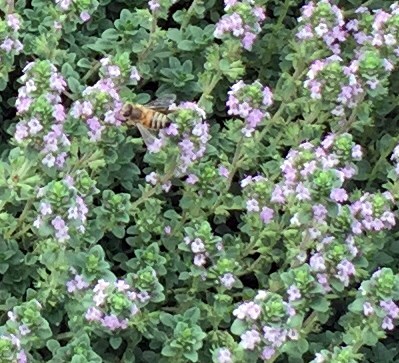 Bees love all blooming thymes. It is also a butterfly favorite and is sometimes included in our Butterfly Attractor 36 Pack Assortment. This plant is often available in plug trays. These trays hold 128 of all the same plant. They are a great low cost way to fill a lot of space. Each cell is 3/4 of inch by an inch. Check here to see if Doone Valley Thyme Plug Trays are available.